Intel on Tuesday launched a family of intelligent gateways for the so-called Internet of Things, providing a series of middlemen, so to speak, between embedded sensors and the data they will store and analyze in the cloud. Specifically, Intel said that its new Atom E3800 embedded processor (codenamed “Bay Trail-I”) will work with Intel’s recently-announced Quark SoC X1000 embedded processor to provide ultra-low-power intelligence. The unnamed gateways themselves, due in the first quarter of 2014, will be designed as two models, one each around the Atom and Quark processors. The E3800 includes error correction and industrial temperature tolerances. The new X1000 line was unveiled by Intel chief executive Brian Krzanich last week at the Maker Faire in Rome. The “Internet of Things” (IoT) refers to a the galaxy of embedded sensors, some of which have been embedded in existing legacy equipment, all of which report some form of information. As an example, Kevin Facinelli, executive vice president for intelligent building systems Daikin Applied, noted that these sensors can be used to communicate what portions of an A/C system are costing the most money, which may need to be repaired, and where those components physically reside within the system. 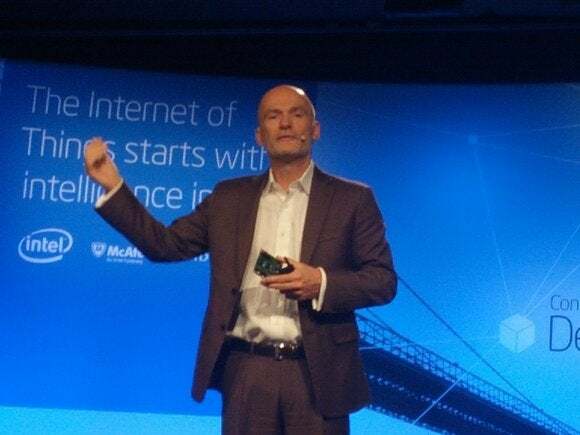 Ton Steenman (pictured above), vice president and general manager of Intel’s Intelligent System Group, said that Intel believes it can make money three different ways: selling the Quark and E38000 chips directly; selling the gateways as a solution, with a bundled Intel Wind River OS and McAfee security solutions; and using the data those sensors and gateways produce as a driver for its server chips, as engines of the cloud services that will analyze and control them. However, it’s not exactly clear how Intel sees all of these revenue opportunities breaking down in the short term; Steenman declined to comment on how much the Atom E3800, the Quark X1000, or the gateways will cost. Steenman said the the Quark will cost less than the Atom, but with billions of units of potential sales. A number of infrastructure companies, including AdLonk, Insyde, DFI, Congatec, and Portwell, will take advantage of the new chips, especially the Atom. Companies in the energy generation industry, including Westfalen Weser Energie, use sensors embedded in the smart grid to provide data about managing and generating the energy that they produce. Within Intel, Steenman said that Intel has reduced the setup time in its assembly plants by 70 percent, as it tracks the flow of parts around the facility. Shaving a few percentage points of cost can save billions, when scattered across the $70 trillion or so that Intel believes the potential Internet of Things market is worth. Greg Brown, chief technology of Intel’s McAfee security division, also claimed that intelligence can be increasingly built in to devices like thermostats, so that they can make smarter decisions about when to turn up the heat. Sharing data with other devices will require a new trust model and a common framework.